The only time I have ever ridden a member of the horse family was a few years ago and only as a transportation. I was on a holiday in Santorini and went down the cliff to go to Nea Kameni. And to get back to the top of the cliff, I had the choice to either walk up more than 588 wide steps or ride a donkey. 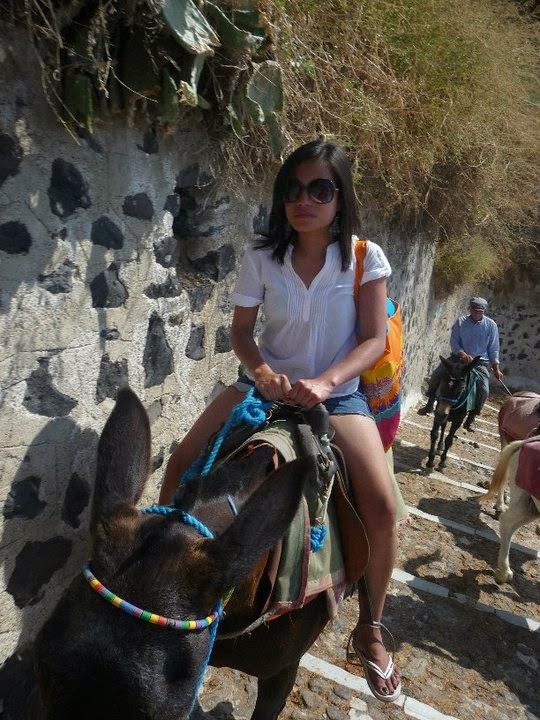 I opted for the donkey ride to complete my Santorini experience. This however, turned out to be one of the scariest experiences I ever had. I have Acrophobia and got really paranoid that I would fall off the donkey and then down the cliff. Whenever I looked down the cliff, I felt like I was going to lose my balance and fall off. That's when I started crying. This is the reason why horseback riding is on my 40 before 40 list. After that experience in Santorini, I wanted to officially learn how to ride a horse. Luckily one of my friends has been riding for some time and as soon as she saw my list, she offered to make one of my dreams come true. It took us this long to get together again because we both work in the healthcare and it's always hard to match our schedules. It just so happened that she has now moved jobs and is off every weekend, so hurray! 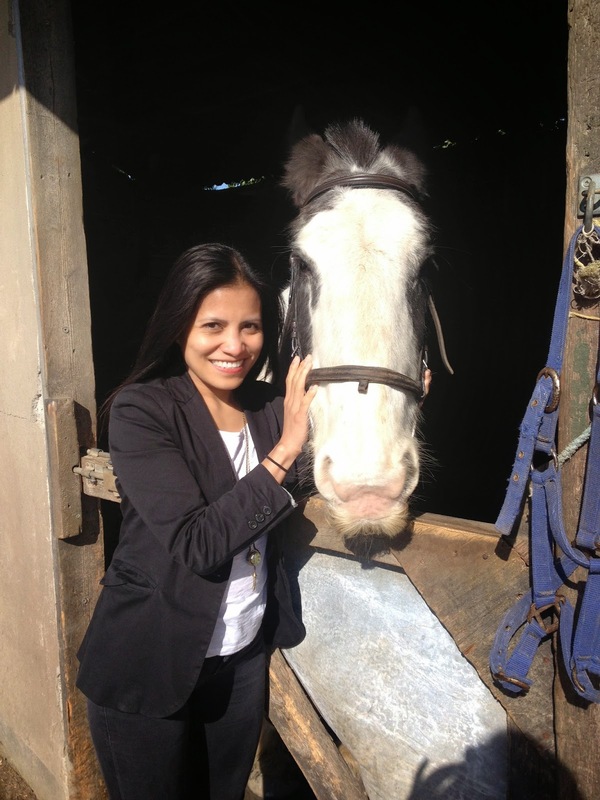 The riding centre is just about 11km outside Bristol. I didn't have any expectations so when we got to the centre, I let my eyes wander. The place looks old, I thought at first. As old as it may have looked, there was this homey feeling as soon as we entered the wooden house. To my surprise, it was not a house. It was indeed a pub. The owners of the centre, Sally and Martin were at the bar when we arrived. They are a friendly couple and they made me feel very welcome. Anyway, each of the horses has a name. Unfortunately, I have such a bad memory that I don't think I remember all of them. As I was walking back to the pub, I saw a couple of girls chatting while leaning comfortably on their horses. I thought that was one of the sweetest things. How often do you see that happening? Honestly, I think I have only seen stables and arenas on television before so I really didn't know how they are in real life until now. Nevertheless, I was so excited to be there that I needed a jump shot. It was a sunny but chilly day. My lesson was not until 11am so I watched my friend first. While watching them, I kept thinking to myself, "I am 38 and it will be ages before I can start jumping". But it doesn't really matter. I will take this seriously and work harder so I can jump real soon. When it was my turn, I was quite nervous. I was nervous because I didn't want to fall. It would have been really embarrassing if I did because I was learning with little kids. Yes we had a guide but because I have such a bad balance, it wouldn't have really mattered. Once my clumsiness strikes, I will just fall. Luckily I didn't this time. Ha, I am a farmer's daughter. When I was a small girl, I used to ride on my father's carabao. I used to watch him do all the things above (only on a carabao). Now it makes more sense. So, my guide was called J. Apparently, he would not normally talk to other people. I never used to either, but now I find real pleasure in talking to people. And so we started talking about riding horses first, then about places we have travelled to and then history. He is only 13 and sounds very interesting. I learned a lot about him in an hour. He seems to be a very nice boy. I hope to speak to him again the next time I go there. My horse was called Shady. According to J, he is one of the best ones and is his favourite. He was right. I felt really safe riding on him. We started by walking around the arena for a few minutes. Once we became comfortable doing that, we were asked by the instructor to trot. That's when I got kind of scared because she made us stand up and sit down again and again for at least two rounds. I tried really hard to keep calm and focus on my balance. 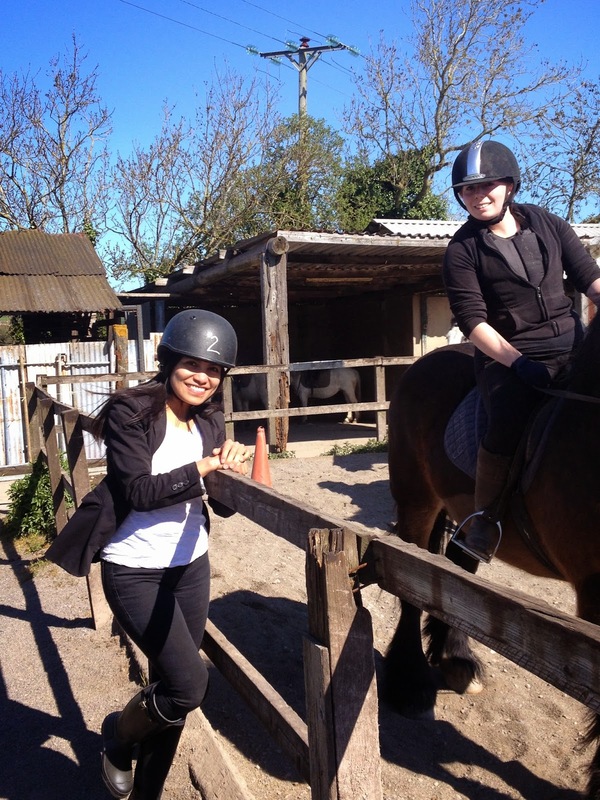 After an hour of horseback riding, I felt so happy. I knew I have achieved something good again. I know this is nothing yet compared to where I really want to be, but I believe one day I will get there. I really enjoyed my first riding experience and I promise I will ride again. I would like to thank my friend for helping me make one of my dreams come true. Also, I would like to thank her mom for driving us all the way to Portishead for the lesson. If you are looking for a new hobby, try horseback riding.